OCMC News - Thank you for a Fruitful Mission Sunday! 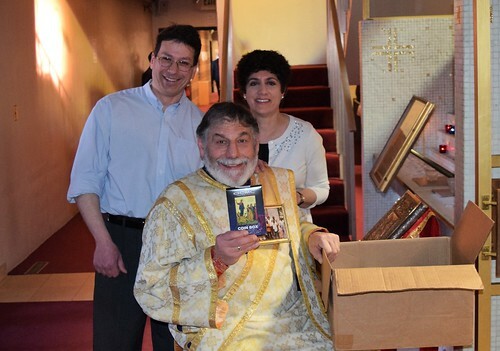 Thank you to all of the parishes and Sunday Schools across the country who distributed OCMC Coin Boxes and remembered Orthodox missions and missionaries in their prayers this past Mission Sunday! March 10th was “Mission Sunday.” As we prepared to enter into Great Lent and celebrated Forgiveness Sunday, it was a perfect opportunity to remember and pray for missionary efforts all around the world. In the weeks leading up to Mission Sunday, OCMC prepared and sent out Sunday School lesson plans and coin boxes to parishes across the country. The lesson plans served to engage the children with a story from the mission field, and the coin boxes were distributed so Sunday School students could collect money for missions throughout the Lenten season. OCMC speakers also traveled around the country, making presentations at various parishes in Washington, Kansas, Ohio, and Florida. These presentations included slideshows, fundraisers, and homilies which helped to raise awareness of Orthodox missions, share all that is happening in the mission field, and invite people to participate in this important work of the Church. These presentations not only brought in much-needed donations for Orthodox missions, but also allowed us to reach and thank the many faithful accross the country who have done so much to help share the Gospel, and to make connections with families interested in missionary service. We’re excited to have these opportunities to help inspire people to find ways to participate in sharing the love and teachings of Christ with the world. Thank you all for supporting our missionaries and keeping them in your prayers on Mission Sunday and throughout Lent! Please consider supporting and growing Orthodox missions ministries with a gift to OCMC, which can be made online at https://donate.ocmc.org. If, during this Lent, you feel called to bear witness to your Faith, join a mission team, or inquire about serving as an Orthodox missionary, send an e-mail to missions@ocmc.org. Additionally, if you would like to order coin boxes for donations, or to invite someone from OCMC to come and speak at your parish, please reach out! You can reach us at (904) 829-5132.